To best accommodate the evolving needs of our customers and address the shortcomings of competitor offerings, Blackline has just introduced G7 Insight, a new and simple solution that bundles gas detection with real-time compliance and business analytics tools. In short, G7 Insight gives time back to teams, allowing them to focus on what's important. For the first time ever, the days of manually retrieving data from docking stations and reviewing spreadsheets are gone. G7 Insight is the world's first comprehensive, managed gas detection program to harness 3G connectivity. With as little as 10 minutes of connectivity each day, G7 devices automatically record, upload and compile data for hassle-free compliance analysis. G7 Insight — What's in it for you? Businesses want to keep their people safe, not waste otherwise productive time replacing sensors, upgrading software or retrieving data logs — G7 Insight does it all, wirelessly and automatically, so our customers don't have to. G7 sensors feature a lifetime warranty, meaning if a sensor fails, the cartridge can be swapped out with a new one in seconds. Sensors continuously monitor ambient gases and G7 records and stores the information, even if the concentration hasn't reached dangerous levels. When G7 devices enter areas of cellular coverage, stored data is automatically sent to the Blackline Safety Network, providing transparency into who was exposed to which gas, the concentration, their precise location and when it happened — all without having to take devices out of the field or retrieve data logs. In the past, adhering to gas detection compliance regulations while maximizing productivity has been a challenge for businesses. Traditional practices leave room for human error, and often mean the compliance status of all equipment is unknown at any given moment. Compliance is managed based on snap-shots, periodically retrieving and reviewing test data, to prove compliance until that moment only. With G7 Insight, data is automatically and wirelessly uploaded from G7 devices, and displayed on a custom compliance dashboard. At every moment, we provide maximum visibility into fleet compliance status. From any Internet-connected computer or phone, teams can quickly see which G7s are in compliance and which require immediate attention. G7 Insight provides all the tools and software needed to achieve a real-time perspective and control over compliance programs. You can't manage what you can't measure. G7 Insight not only delivers more data than available from beep-and-flash detectors but it also delivers effortless review within our Blackline Analytics software. Usage duration, location information, and device configurations are automatically recorded, stored and uploaded by G7 detectors to the Blackline Safety Network when in areas of connectivity. 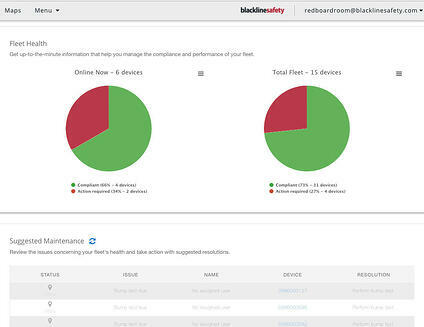 Easily see who is using equipment properly and who isn't, and even identify which docking stations aren't being used. To further empower Blackline Analytics, G7 detectors tag gas detection data with location information. The position of each gas exposure is automatically displayed on a map, so teams can plan proactive facility maintenance and reduce fugitive emissions. G7 Insight customers can use G7 person-worn devices just like traditional gas monitors. Featuring a lifetime warranty, G7 gas sensor cartridges are designed to customize gas detection functionality and minimize sensor maintenance and replacement times. Modularity also makes it easy to reconfigure G7 devices with new sensors as needs change. Gas sensor testing and calibration capabilities are built directly into G7, enabling it to accurately communicate all test data for compliance reporting to the Blackline Safety Network when in areas of connectivity. G7 Dock makes bump tests and calibrations easy — G7 Dock leverages the connectivity of G7 devices instead of requiring the complexity of a networked docking station, simplifying testing while minimizing the investment in complicated docking stations. We designed G7 Insight to be scalable to accommodate the needs of every customer through a series of service upgrades. G7 Insight is part of our overall connected safety portfolio that includes real-time alerting to a live monitoring team, voice calling, premium gas sensors and a lot more. Blackline developed the world's smallest connected gas detection system with a built-in pump. Like all of Blackline's gas sensor cartridges, our pump cartridge can be installed onto a G7 device in seconds. The pump cartridge features Blackline's lifetime sensor warranty that also covers the pump. G7's advanced firmware includes configurable modes — users can simply toggle between diffusion and pump modes based on their activities, providing additional customizability. Let us know if you have any questions on how our G7 Insight program can replace your fleet of existing gas detectors while delivering real-time compliance tools and business analytics.